If you, like me have never experienced a GP14 cruising event I urge you to give it a go! 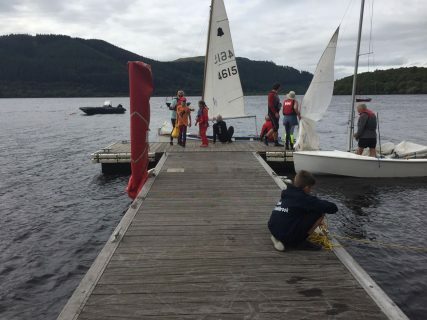 Four boats gathered for the ‘Swallows and Amazons’ themed event that we held at Bassenthwaite over the August bank holiday weekend, and although this may not be a large number, the level of enjoyment and great fellowship far outweighed the size of our flotilla. I took the Old Yellow Boat over from York and at my invitation we were joined by Pete and Niclola from my club, with their two youngsters, Ellie and Michael plus the ancient club GP. Alan and Vivienne travelled all the way from Bristol with their Series 2 boat and Ed brought Lumpy Custard with his young crew Zak, plus Zak’s non-sailing mum. We were also joined on Saturday by Ralph of Areoluff Spars, who having met me at the Dinghy Show back in March, was very keen to come over and demonstrate his patent roller reefing system on a GP14. And he turned out to be quite a guy if you want to go cruising big time! The first thing one has to realise is that unlike racing, one can relax at these events! So although Saturday morning involved an early start from York, there was plenty of time on arrival to chill out, rig and erect the tent. Pete and family were already there with the vintage VW camper as were Alan and Vivienne complete with rather splendid tent, (quite unlike my hovel!). Ed and Ralph arrived soon after and with skull-and-crossed-bones flying and water-pistols primed, we all took to the water for a long afternoon of exploration of the lake in fine weather and a fair breeze. 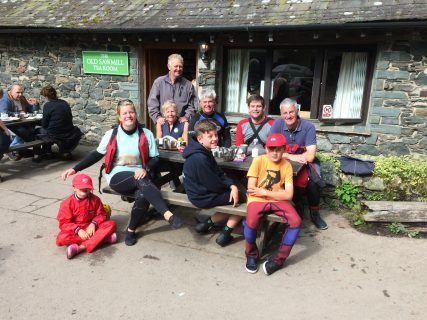 August bank holiday at Bassenthwaite SC is one off their own camping weekends and the place was buzzing with activity on our return: lots of happy family camping groups and a number of visitors from other clubs. All the facilities of the club house, including the excellent kitchen, were at our disposal so this really was camping made easy. A big ‘bring and share barbeque’ was held on Saturday evening and mellowed with glass or two of Nicola’s special rum brew, we relaxed in the gathering dusk and enjoyed Ralphs tales of crossing the North Sea (several times!) in his Wayfarer. Having reconnoitred the lake on Saturday we decided that the Sunday sail had to involve a destination and preferably one with a tea shop! And so it was that we set forth in a stiff breeze and sunshine to find the Calvert Trust’s jetty on the East bank, from which a short hike through glorious scenery brought us to The Old Sawmill Tea Rooms above Mirehouse, where we were met by Zak’s mum who had taken the much less exciting option of driving round! By the time we had scoffed huge sausage-filled baps and cream teas the wind had freshened further and we decided it was time to return to the jetty and for Ed to demonstrate his reefing skills on the elderly YRISC club boat. This done we all made it safely back to base with Michael and Ellie helping to plane the Old Yellow Boat much of the way! The wind was forecast to rise still further on Monday so we packed the boats up on Sunday evening and repaired to the club house for a wonderful joint feast, prepared by Nicola with input from all. It was a fitting end to a great weekend of shared experiences and new friendships. Following the “Bassenthwaite Cruising Capers” event I have decided that if this is GP14 cruising, then it is definitely for me! Ed will be working on ideas for next year so watch the web site and do come and join us. PS If you would like to know more about Ralph’s ingenious roller reefing system just google Aero Luff Spars. I feel quite sad now.I thought about attending the meeting but saw it was limited numbers.I presumed it would fill up quickly.Had I known Myself and my Wife would have attended instead of heading to the Norfolk Broads.Mental note to enquire and not presume. Hope you make the next cruising event Mike. Clare and I had great fun with the cruising gang at Windermere earlier this year. As Steve says it’s all very relaxed and great fun.